MacDailyNews Take: Cutting taxes and regulations certainly seems to have contributed to lifting the U.S. economy. Growing consumer confidence and increasing wages bode very well indeed for companies like Apple and for the economy in general. The feckless Obama’s reign of malaise ran from January 20, 2009 to January 20, 2017. Sorry, NPC, didn’t mean to blue-screen ya! You act surprised. First Whatever is a paid troll for the GOP. No idea from any non-card carrying member will ever be good, and no mistakes are ever made by his team. 17% increase in federal deficit in 2018, projecting to add over $1T to the burgeoning debt. One wonders if First Whatever manages his household budget in a similar manner. Lookie here, another liberal has a major problem with the small debt increase under President Trump and says absolutely NOTHING about Obama doubling the national debt in eight years more than all presidents before him. And when does the other shoe drop as a result of fewer regulations? Remember what happened to the banking industry? Sometimes economic advantages are merely temporary before their real cost potentially takes us into another depression. I hope not. If it seems too good to be true it’s probably not. Fewer regulations?!?!? You can’t be serious. You could say “different regulations” but not fewer regulations. To quote a portion of it: “The Federal Reserve, under the chairmanship of Alan Greenspan, created the massive housing bubble by over-expanding the money supply. President Bush and members of Congress, through the Community Reinvestment Act, intimidated banks and other financial institutions into making home loans to people ineligible for loans under traditional lending criteria. They became subprime lenders. Lending institutions made these loans, now often demeaned as predator loans, because they knew they’d be sold to government-sponsored enterprises (GSEs) Freddie and Fannie. Uhhh—that was Clinton, not Bush. Feckless malaise must me something very special, let’s check out the data under the ohbummer. So for all those years even though that country wasn’t number 1 they were in the top 10. Some would say that’s pretty good/excellent but for no we have feckless malaise. Well you figure it out but at least now you have some data (thanks Wiki). npc . I see you got the latest talking point. Could have had the prosperity from the corporate tax cut ( at an even better rate!) even earlier when Obama tried it, but republicans refused to pass it until Trump added big tax cuts for the rich as well. Trump going to take credit for the 4% overall world growth? Well considering that it was thought to be impossible and he’s the only one making any real-world economic changes I’d say it’s reasonable for him to do so. Nobody thought 4% growth is impossible. Every economist that isn’t on the republican payroll however knows that sustained economic growth at twice the population growth rate, especially when funding endless war and putting up trade barriers with every country except oil producers and servicing massive accrued debts is a fantasy. Every day the paid republican trolls come to mdn to expose their fantasty, so it will be interesting to see who they blame when the sugar crash comes. How do you know that? You don’t! Are you also saying paid Democrat trolls come to MDN to expose their fantasy, hmmm? You post this every time. The article is not about the stock market. Duh. Wages have been going up. Wages going up in June were the strongest in years. Wages continue to rise though not as fast as people would like. The tax cut effects the economy across the board. It was not some rhetorical giveaway to the rich. You need to toss your silly talking points pamphlet into the trash and try the a freaking financial journal for a change. Dave is correct. The worldwide economy goes up 4%, wages go up ~ 2%, inflation goes up 2%, and federal deficit balloons 17%. What freaking financial journal do you read that allows the USA to be successful in the long run when running 17% in the red during what should be a prosperous peacetime economy? Don’t forget that Trump’s trade war effects haven’t even hit yet. His proposal to offset the tragic agricultural impacts was to issue one-time welfare to American farmers. More debt. You aren’t fiscally conservative, are you? Peacetime? While we aren’t in all-out “traditional” war…we are at war..and have been for some time. You just don’t read about because it isn’t reported. Just pointing that out knowing it has little to do with your point. I think Mike’s point stands. For some unknown reason, despite setting up and leading multinational peacekeeping organizations over the world, the US has chosen to usenits military to police the entire planet, especially those nations that have fossil fuels. This is why US leaders are paranoid and poor US taxpayers have funded continuously a war machine that has been in use without an honest stated purpose with secret and open wars since 1946. Eisenhower warned the voters but right wing xenophobic propaganda has repeatedly put the party of war in power. Not that anyone can tell the difference between the two corrupt parties. Each is a puppet organization to corporate masters, all profiting from war. Fun little exercise, go back to 1776 and make a list of all the years that Apple’s home country has been at war. Then divide by the total number of years and multiply by a 100 to get a percentage. It’s like really really high, over 85%. In other words, when it comes to peace, Apple home nation doesn’t know much about it. Trying to argue with NPCs is a fruitless endeavor, but you’re right nonetheless. Businesses afraid to spend money completely confused about insane health care plan and additional taxes. Everyone had this WTF is he going to pull next attitude. Even his fans! Now much more optimism. I have one client finally replacing iMac 12,1s and a few machines purchased in 2007! I just hired an assistant/trainee for the first time since 2007. Part of the deal is I buy them a computer, get them trained, and consult on their ongoing education. Although I wouldn’t even look at female assistants because there would be too many times I was working alone with this person. So some things are exactly the way the left wants. Hw much did Trump personnaly decrease your health insurance premium ? 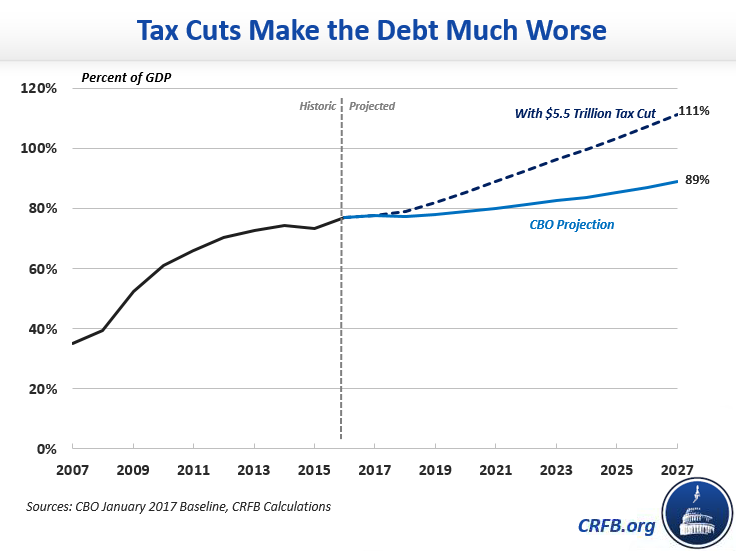 We are seeing the continuation of the Obama recovery fueled a bit by massive tax cuts that have accelerated our deficits to nearly unprecedented levels, particularly in times of so-called prosperity. Our debt is accelerating, and the right will likely come after paid-in benefits like social security and Medicaid, and then other programs that help low income Americans in order to accelerate the further redistribution of wealth from the 99% to the .01%. Delusion as a personal motivator must be popular amongst liberals. Weak sauce, Thelonius Wannabe. How come deficits don’t matter when the red team is digging the hole? 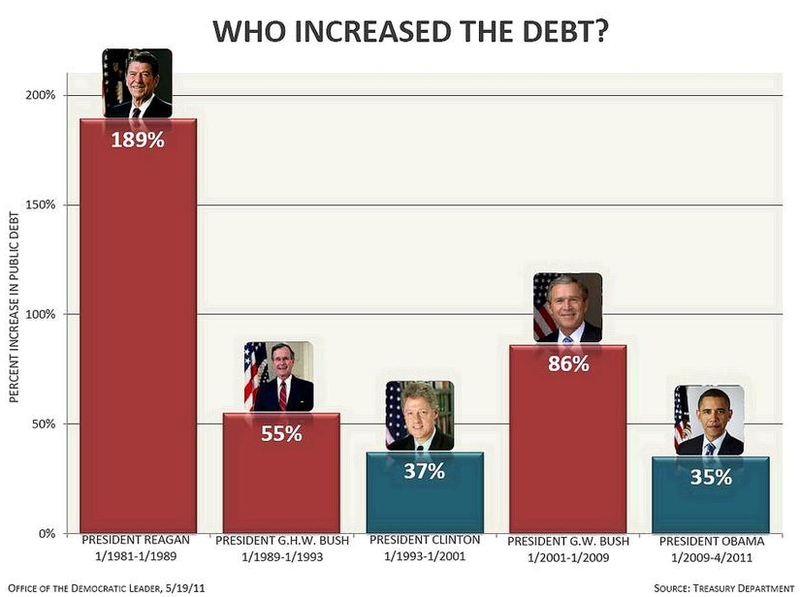 Why do you only care about deficients and debt under a Republican President, not when your feckless wonder was DOUBLING all of the U.S. National Debt in a mere 8 years? Obama inherited an economy in freefall. Corporate welfare was used to stop the carnage, proposed by a republican Fed chairman and voted on with full support by republicans. Now you have the gall to blame Obama for being in the White House when the fit hit the shan? You are a pathetic ugly partisan. If you were honest, you would see that both corrupt political parties are to blame for spending far beyond America’s means. However, the debt has risen faster under republican congressional control and the republicans lie incessantly about trickledown. Have their tax cuts EVER paid for themselves? No, they reward the 1% and put the bill on the American credit card for your children to pay off. Did the your bank account explode as fast as your heros bloared the public debt? I doubt it. NO, I don’t label “everyone the left” only those that deserve it. You have a problem with labeling people? But since your a hypocrite you have no problem disrespecting the president with “your orange hero” and “corrupt orange bozo” insulting labels. Practice what you preach, pal. Oh, and that’s President Donald J. Trump to you. Well bozo, you can start with reading the article and just not the headline, “U.S. again assumes throne as world’s most competitive economy; first time since 2008” And another recently from MDN that U.S. unemployment is at a 50-year low. From there you can learn to read U.S. economic numbers the last two years and educate yourself on foreign accomplishments such as eliminating ISIS and putting Syria on notice with a red line that actually is enforced. “The left”, as you label everyone else, has no more hypocrisy than your party. Your orange hero has no data to support the so-called economic plan. Trump is doing the dirty work of American oligarchs to enrich the 1% while entertaining and distracting the least educated rabble. It will work in the short term, too. Everyone righr and left agreed the stock market will surge, the executives will pocket their bonuses, and Trump will declare historic victory. Problem is, the debt outnof control. CBO projects a yuuuge debt crisis mounting in the next few years. The republicans will choose to axe entitlement spending which Americans have paid into for generations. Trump will whip up xenophobia to scapegoat immigrants and build popular support for corporate welfare in the form of military overspending and national policing. Nor a dime or a minute from this administration has been expended to figure out how to reduce healthcare costs, halt the opiod epidemic, pass a balanced budget amendment (let alone write one), end foreign wars in Afghanistan and elsewhere, protect American IP from theft abroad, reign in foreign & domestic misinformation campaigns, increase world trade, or improve American industrial efficiency. Trump couldn’t even be moved to reform welfare or push job retraining programs to fill the many vacancies that do exist without qualified sober Americans to fill the jobs. Trump has only delivered to the rich their tax cut, which is akin to lighting the fuse on a credit bomb. Your move, chief. Tell us how America has been saved by the corrupt orange bozo. You are being intentionally stupid, First Whatever. You live in an an upside down world without a moral compass. You refuse to understand the timeframes involved, how costs are incurred, then bills are paid. Economic trends like the 2008 crash didn’t just happen when Obama walked into the White House, no matter how much you wish you could claim it so. In large economies, it typically takes years or decades for policy and economic underregulation to play out. One item occurs before the other. Your binary “my team is never wrong” thinking continues to blind you to reality. Worse, you pretend that we are not all in this together. You don’t want a win/win scenario. You must claim to win, and you must discredit your neighbor at every turn. The corporate bank malfeasance occurred during the laissez faire late Clinton and throughout the entire Bush years, and the credit card charges were transfered to the federal debt under Obama’s watch, PLUS the unbudgeted war costs that Bush racked up. Don’t forget that. Obama was honest enough to put those in the budget and account for the mliitary expenditures honestly. Regardless, taxpayers are always left holding the bag. You’d not going to ever recover the mideast war costs no matter how much blood-soaked oil you pump out of Iraq. When it comes to mortgage fraud, some banks have actually paid back the fed with interest. Others have not, but your team insists that the corrupt backs should be unregulated. Sarbanes Oxley is just too haaaaard, whaaaaaaaa. I think that the biggest few remaining banks should be split into separate investment and savings and mortgage lending banks, never intermixed to hide who’s laundering the money at any given moment. Your team has no proposals for financial reform and seem not to care how much consumer and student debt goes out of control. Ignore debts at your peril, First Whatever. Keep drinking that Kool-Aid you dunce. If you’ve ever picked up a video game that features other characters that are controlled by the computer, then you’ve run into non-player characters or NPC’s. NPC’s serve a host of different functions depending on what the program you’re playing with needs them for. They’re the villagers in Skyrim, Toad from Super Mario Brothers, and the ghosts in Pac-Man. NPC’s may have dialogue, patterns, and personality, but at the end of the day, they’re just a program with pre-set behavioral patterns decided for them by a developer. If you’ve ever stepped onto a college campus or a protest demonstration that features people with neon colored hair screaming at the top of their lungs about identity politics or a social concern then you’ve run into a social justice warrior or SJW. SJWs serve a host of different functions depending on what activists, politicians and the media need them for. They’re the crazed people trying to beat down the Supreme Court door, the Antifa members threatening motorists, or the male-feminist roundhousing a woman for expressing pro-life views. SJW’s may have dialogue, patterns, and personality, but at the end of the day, they’re just a program with pre-set behavioral patterns decided for them by professors, activist groups, or the media. The comparison between NPC’s and SJW’s is pretty striking and simultaneously hilarious. This is awfully reminiscent of the way NPC’s interact with gamers in the virtual world. Outside the bounds of what the programmers gave them, the NPC’s aren’t capable of doing much else. Talk to one enough and eventually, they’ll run out of things to say, and begin repeating the same phrase over and over again. They even made a joke about it in the Jumanji sequel. Since the gaming community is no stranger to the behavior of SJW’s thanks to the GamerGate movement, it was probably only a matter of time before someone made the connection between the behaviors of the preprogrammed NPC’s and the indoctrinated SJWs. Thus the NPC meme was born, and gamers have been referring to SJWs as NPCs with hilarious effect. While I’m in full belief that even SJWs have the capacity for rational and critical thought, the fact that they choose not to employ it, even in the face of brutal facts, earns them the label of NPC. If your entire identity revolves around the superficial, and your entire belief system revolves around instructions from someone else, then you’re about as good as a computer program. If you won’t engage in civil debate, and instead scream tired phrases at people when you run out of things to say, then there’s no person there, just a shell that somebody else is speaking through. I would only add that social media seems to make matters far worse. It’s like the Outrage Olympics where people get offended at everything all the time. Or they’re seeking validation and “likes” for their constant virtue signaling. And their hypocrisy knows no bounds. Well we all know you are one sick sick puppy and here you go again. NPRs never get to be part of any game. They are irrelevant cannon fodder, deliberately controlled and powerless to direct play. So this is how you view the other half of the political spectrum? Where the opposition must be artificially eliminated, not given the same advantages, privileges, status nor afforded the same rules of political game play. Simply put – you are a fascist and unAmerican. Just because you personally wouldn’t spare a dime to help even a guiltless victim, you think you have omnipotent rights to control the world? Sick is hardly the word. Oh the faux outrage! Must be exhausting being you. It appears First Whatever just outed himself as a Non Player Character. He/she/it regularly pops up on MDN to drive the discussion in to highly partisan politics, exposing his biased views rather than adding to the discussion with facts or data. Regarding the republican tax cuts: middle class was temporary, and the working class hasn’t seen real wage growth in two generations. But instead of incentivizing worker training or college or other beneficial tax reductions, the working man got pennies cut off his tax bill for a few years. Billionaires and corporations, already awash in cash, got a permanent tax cut that did not pay for itself. How many times do we have to reprove that your dream of voluntary trickle down does not work? Bush did more to blow up the debt than Obama with war spending, and now Trump is pumping up the debt with Billionaire tax giveaways. You can’t keep spending more than you make. When is your fiscal genius party going to balance the budget? Did Mike say that or as usual are you putting words in other people’s mouths? I believe several people have correctly attributed the 2008 crash to an unfunded war plus bank malfeasance plus a population using credit debt to sustain their standard of living while their actual wages have stagnated. much are distracting fud and venom. Between golf games and TV time, Trump hasn’t put any effort into long term economic reform. He is working for oligarchs, not the workers he holds rallies for. I stopped reading right there. You are a pathetic partisan LYING liberal. I told you before brainless, learn to read government statistics that prove you dead wrong. So far in 2018, wage growth averaged 2.7%. Inflation grew 2.9%. The result is that workers real wages have fallen. Stagnated like the prior generation. Independently wealthy executives and corporations on the other hand are pumping their tax rebates into foreign bank accounts and stock purchases. You should read more and type less Goeb. I read more than you know, both left and right media. Gee, what a surprise! Greed has set in again as a direct result of the booming economy. The number one culprit right there is the oil companies soaking us again that the WP correctly pointed out. Their operating costs are lower. Their taxes are lower. Their regulations are lower. They can drill in the Gulf again. Alaska is open for more exploration for the first time. The Keystone pipeline is approved. The U.S. is the number one exporter of oil, but why export? Can’t figure that one out. Why not use it here. Better sit down Democrats, I blame President Trump for giving the oil companies everything they wanted and doing NOTHING regarding the high price of oil. He should be on their asses big time! Also add in the mix the Democrats raising property taxes, the Democrat teacher unions raising taxes, the high prices of butter, eggs, milk and red meat and everyone else taking advantage. Nay, nay…socialism, government regulations, attacking the private market, and more socialism is the reason for this prosperity. We need Hillary and Obama now more than ever.